The last thing I want to do is come in here and tell you you're doing your makeup all wrong. But the truth is... you might be. When it comes to applying products to your face, there actually is an order. According to beauty experts, putting your cosmetics on in the right sequence can actually prevent mistakes and create the best overall look for your face. Of course, no one cosmetologist is right, and if what you're doing works for you, then great! But I've found that taking these steps produces the best, long-lasting and flawless face of makeup. Creating a strong, moisturized base is crucial for a (almost) perfect face of makeup. Choose a moisturizer or primer that is light and has built-in SPF. Now that you've got your base ready, you can begin to build on it. Think of your foundation as your canvas. Although some people believe in doing their eyes before the base of the face, I argue that it's better to do it the other way around. Foundation and powder can accidentally cover your eyeliner or taint your mascara, causing you to have to touch up or do it all over again. Dust a loose powder over to help secure the rest of your face. This will give your foundation and powder time to set while you work on the other areas of your face. Now, for the eyes. Carefully apply your eyeliner, eyeshadows and mascara. If some of it falls out on to the rest of your face, no worries. It's actually easier to clean up on your base of makeup than bare skin. Once you've done that, focus on your brows. Remember to step back and take a look in the mirror to make sure everything is balanced. You don't want to go overboard on both, especially if you're applying is a daytime look. Now that your eyes and brows are done and the rest of your face has had time to settle, you should apply your blush. Because of this, it'll have a better chance of lasting the rest of the day. I think it's best to apply any sort of lip color at the end of your makeup application so that you can adjust the intensity based on the rest of your face. 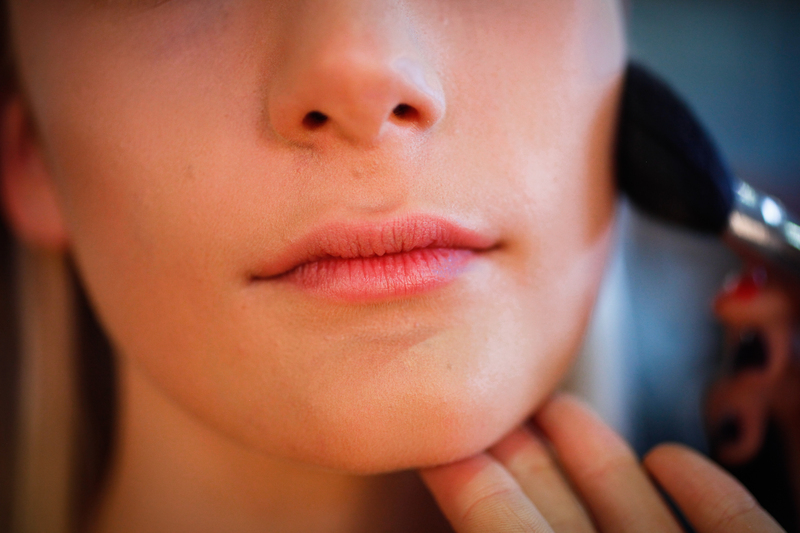 If you are going to wear lipstick, remember to apply a lip balm first to prime your base. Consider applying a lipliner to help your lipstick last longer.